Welcome back friends! Thank you so much for following up with part 2 of my Hawaii vacation blog! As I said previously, there is no way I could fit all my Hawaiian adventures into one post! There is just too many amazing things to share! North Shore was at the very top of our list of places to see on Oahu! We wanted to eat there, play there, and soak up the culture! I can honestly say we emerged ourselves in the laid back-chilled out culture! North shore has such an ease about it! Unlike any other location on the island. North shore has a vibe that is truly it's own! I felt as though time did not matter...the hours of the day were measured in sunshine and the amount of time we would have to soak up the sweet rays and be in the crystal blue surf! We sat for an hour looking in awe at the waves of pipeline! Summer is not "big wave season" but I still can not imagine going up against the furious waves we were watching! We watched surfers skim over the surf like it was child's play! So cool! So Hawaiian! The houses that lined the north shore were adorable! I can only imagine the lifestyles they must live. Imagine watching pipeline in your Pjs while drinking your morning coffee! Shark's cove was one of the spots we knew we wanted to snorkel at! To be perfectly honest I am not the best snorkeler...my husband picked on me! By the end of our trip I got the hang of it, and I am so glad I did! There is a whole other world beneath the water! The fish and coral were gorgeous! After working up an appetite snorkeling we walked along the beach until we found an amazing food truck next door to the North Shore Surf Shop! They had a great selection of fresh caught seafood! I had mahi kabobs with salad and the most heavenly brown rice I have ever tasted! This was one of our favorite meals on the whole trip! There is something about eating fresh caught fish of the day in your swimsuit with sandy wet hair on a picnic table after snorkeling for four hours that is simply divine! We followed our meal up with a frozen treat from the Shaved Ice truck next to the food truck. Just like that we were hooked on food truck cuisine! We began seeking out renown food trucks to feast at on our daily adventures across the island. I would definitely recommend this mode of dining to anyone visiting Hawaii! After snorkeling Shark's Cove all day and eating multiple times from a variety of mobile eateries, we had one thing left on our list to do in North Shore, see sea turtles! One thing you must know about me is my intense love for animals! I will jump at any opportunity to be up close and personal with animals. When I heard there was a location near North Shore where you could sit and watch giant sea turtles sun themselves I was determined to go! After two separate trips to (Laniakea Beach) or Turtle Beach as the locals call it we finally saw them! I was so impressed with the measures of security taken to protect these beautiful turtles. We learned there is a group of volunteers who take turns around the clock watching the turtles ensuring that they are not touched or harmed in any way. 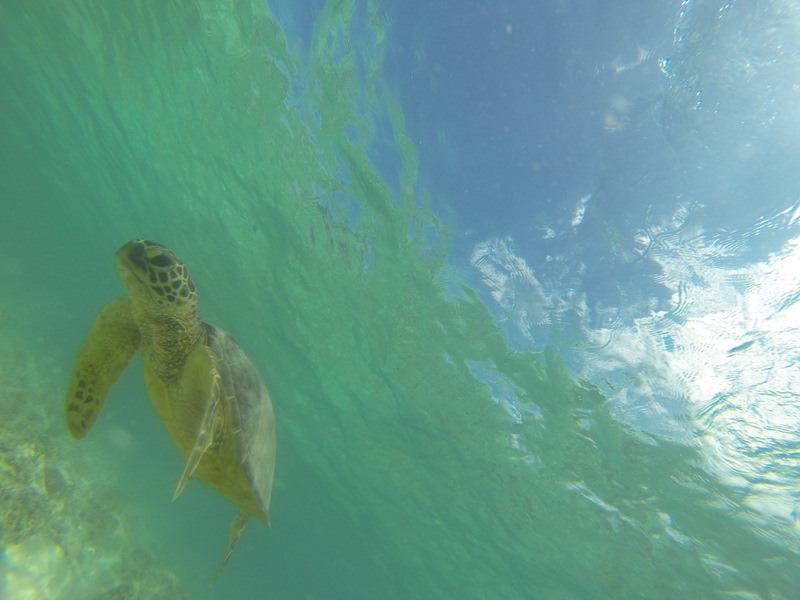 Green sea turtles can live to be 60-70 years old and are an endangered species. They are well protected in Hawaii by laws and dedicated volunteers committed to their preservation! I love that! My husband and I tend to steer clear of tourist attractions or guided activities as a whole on vacation. However, we decided to try a guided kayaking tour of the Lanikai Mokes. This guided tour proved to be one of the most fun and authentic activities we did on the trip! To start our tour guides were awesome! After arriving at Kailua Sailboards and Kayaks we were greeting by our guide Po. He was awesome to spend the day hanging out with! After getting all of our gear together and a quick "how to" instruction, we were off into the ocean! My husband and I had the best time kayaking together! We laughed and chatted while taking in the insanely gorgeous scenery around us! Lanikai is home to the Twin Mokes! A moke is basically a small island in its simplistic definition. We kayaked for about an hour and a half to reach the moke. The weather was phenomenal, breezy and sunny! Once we arrived on the moke we had lunch and listened as Po gave us the locals perspective on all things Oahu! We got recommendations on restaurants, places to see, and things to do that we would regret going home without experiencing. After lunch we headed off on a hike up the moke! We stopped along the way and listed as Po explained the history of the mokes and the history of the royal family who once came to the moke as a private retreat! Part of the reason I wanted to do the kayak tour was to swim in the Queen's Bath! Po explained that the Queens Bath was a section of the island that only the queen could enter. She would hike out to this spot and soak in this mineral pool alone. Now centuries later common folks like us can enjoy the salty bath as well! It was a great experience to jump into this rocky crevice and sit in the saltiest water I have ever been in as the waves crash against the rock beneath us! You can't go to Hawaii without attending a luau! Before even arriving on Oahu we had heard repeatedly that the Polynesian Cultural Center hosted the crème de la crème of luaus! We knew we wanted to attend a dinner show and get tickets for there big luau performance show. We were not disappointed! The Polynesian Culture Center was beautiful and perfectly set up to educate visitors on Hawaiian history. The dinner show was nothing short of a feast! All of the traditional Hawaiian cuisine was represented. The feast was held in a beautiful raised level venue. Every seat was a good seat for the dinner show. We were introduced to various types of luau dancing and traditional dinning customs! It was an amazing experience! We thoroughly enjoyed the food and the show! After dinner we moved into a giant arena to see the luau production Aha: Breath of Life! This was a spectacular display of Polynesian history! The performers were flawless as they danced and sang and threw fiery batons to the sounds of applause from the audience! It was spectacular and a must see while on Oahu! On one of our final days in oahu we booked a helicopter tour! My husband is fascinated with aircrafts and anything to do with flight! This tour was at the top of his list and therefore the top of mine! 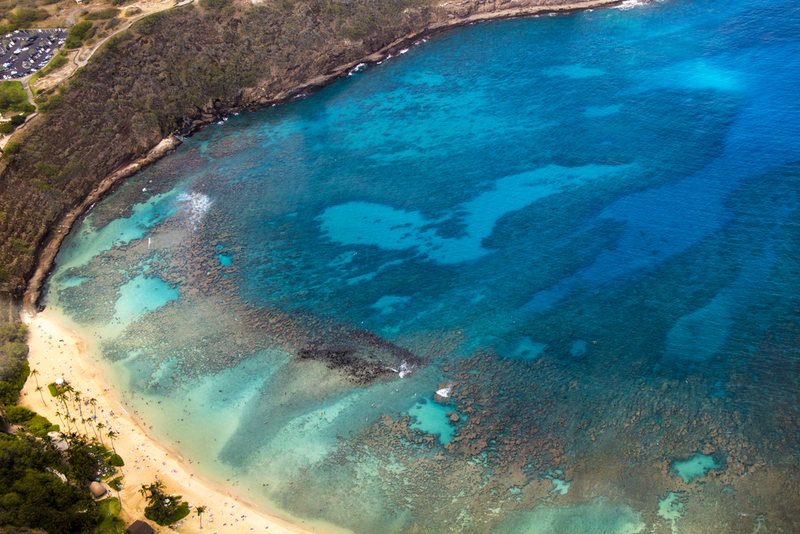 We chose to fly with Blue Hawaii Helicopter and this was the best decision we could have made! The staff was beyond helpful and friendly and our pilot was awesome! He made the flight fun and entertaining from take off to touch down! Our tour included a fly over of some of the islands most beautiful spots and a few locations that can only bee seen from the air due to laws restricting entrance! The sacred falls were breathtaking and the flight over Pearl Harbor was such a unique experience. I would recommend this helicopter tour to anyone and everyone! We were so happy we were able to experience this! Even though I had motion sickness for most of the flight it was still one of my favorite parts of our trip! Two of the attractions we knew we had to experience were Pearl Harbor and the Dole Pineapple Plantation! Two very different experiences but both need to be seen when on Oahu! Pearl Harbor was nothing short of breathtaking and humbling. 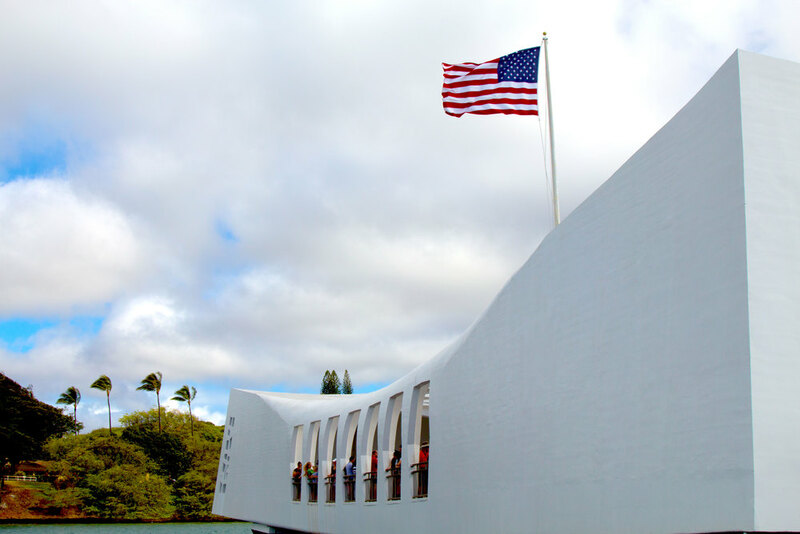 What an honor to stand in reverence of the many heroes who lost their lives in the attack on Pearl harbor. I felt overwhelmed by emotion the entire time. The monument was beautiful and the entire experience was one I will never forget. 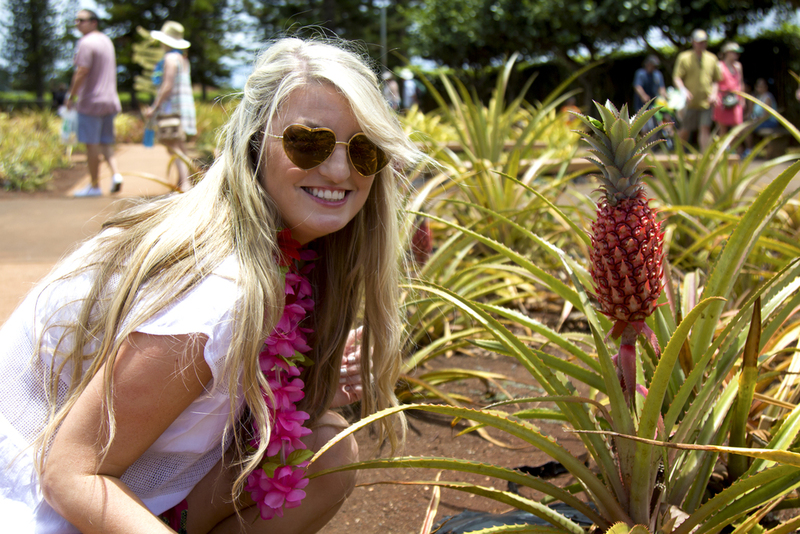 The Dole Pineapple Plantation was a must see for me! It was such a fun experience to see how the pineapples are planted, grown and harvested! We walked around the grounds looking at pink pineapples and beautiful tropical foliage while eating Dole Whip! This was a nice light hearted activity following the heaviness we felt leaving Pearl Harbor. Two very different activities on one day, but both made our Oahu experience complete. Thank you so much for visiting the blog and taking the time to read about my Hawaii Vaca! We had the time of our lives on this trip! I hope you enjoyed reading about it as much as I enjoyed writing about it! If you have any questions please feel free to leave them in the comments below! I would love to chat with y'all! Until next time, Aloha!